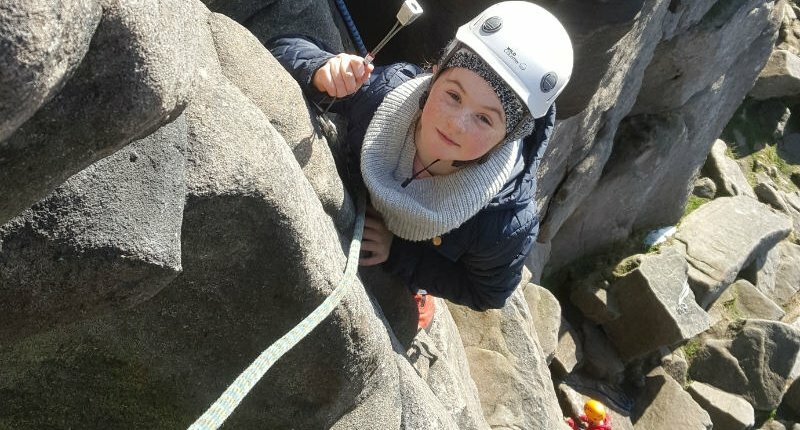 Since the days of wearing nappies my kids have been climbing indoors and out. Contrary to popular belief this wasn’t just because I wanted to train up three potential climbing partners for my future days at the crag but because I genuinely believe that a kid climbing is seriously healthy for them. It’s not just a physical fitness thing either. When you see kids climbing you will see them testing and adjusting their position, thinking through what they’re doing, constantly problem solving, and generally using their brains as much as their brawn. Kids need to climb! It’s a few years ago now, but I seem to remember my kids climbing the stairs not long after (or was it before) they were walking. They were certainly in nappies when I started taking them to the local bouldering wall. Try it, and see how it goes. If it doesn’t seem to interest them, leave it for a few months and try again when they’re that bit older. (The theme I’m going to encourage here – is to follow their lead). Either way it’s never too late to start! Kids constantly need feeding, and stopping for a break is always a nice way to help maintain concentration. In the early days I found that if I supported them around their body they’d generally just lean back into me and let go of the wall. Then an idea occurred to me… Often a good mantra when learning to climb is “take care of the feet, and the hands will take care of themselves”. So when you’re kneeling there behind your newly climbing toddler, don’t support their bum or body but place your hands on their feet. You then move their feet onto the holds and as their feet rise so they will use their hands to find and use the higher holds. 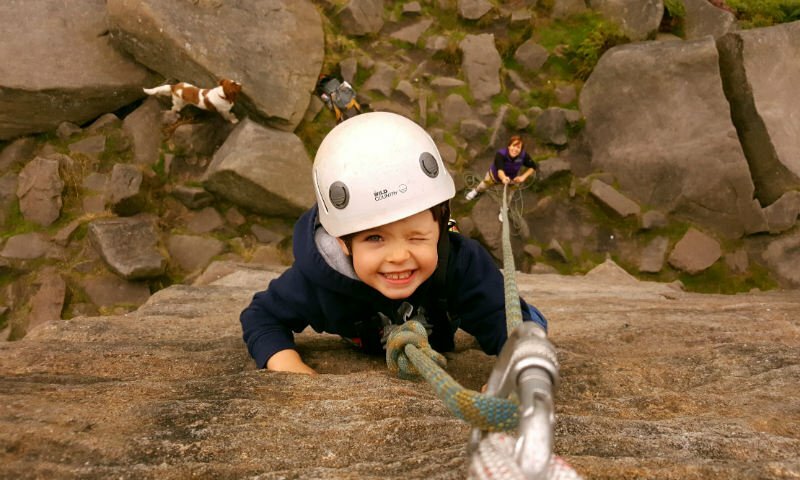 Early climbs – helping your kids manage their first climbs by placing their feet for them. 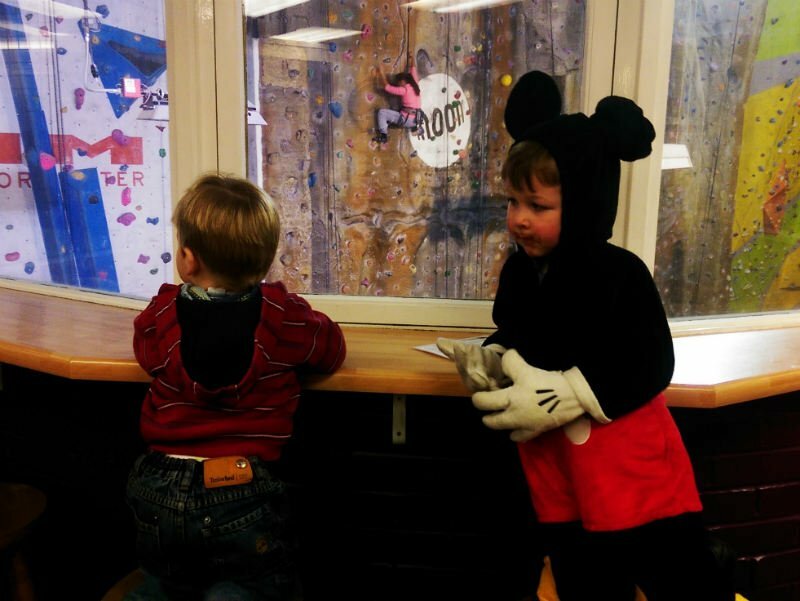 This would involve me placing a Hula Hoop (instead of a cuddly toy) at the top of selected bouldering routes. Gradually I’d set harder challenges. This saw my kids really improve their climbing. And, just one packet really goes a long way you know! When Patrick insisted on going to the wall dressed as Micky Mouse, I should have known we wouldn’t be getting much climbing done that day. If I took the kids climbing as much as I wanted to go climbing then in no time at all they’d see it as a chore. I take the kids climbing every now and then. This way it keeps it fresh. Also over-climbing can be counter-productive and lead to injuries. (See article below). As your kids get older and stronger, graduate them to climbing bigger walls with harnesses and ropes. It demonstrates to them a natural progression and keeps things fresh. 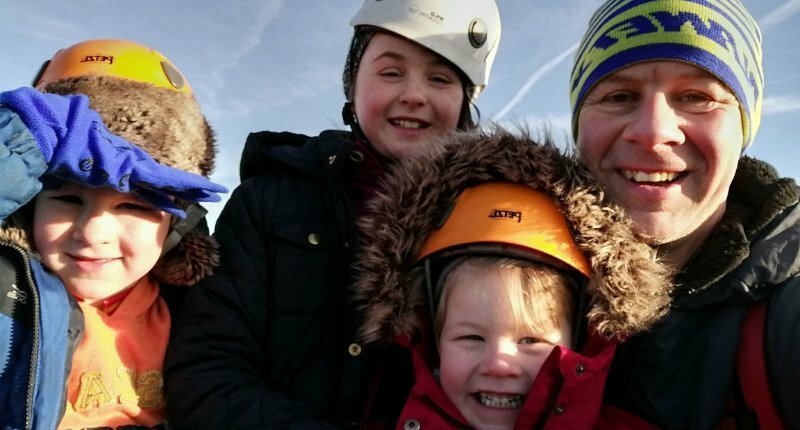 And as well as climbing on longer routes, they will simultaneously need to start learning new skills: tying in to their harness, belaying, communication skills and so on. The rule we have, is that if the kids want to come down, they can come down. I won’t ever force or coerce them to finish a route to the top. 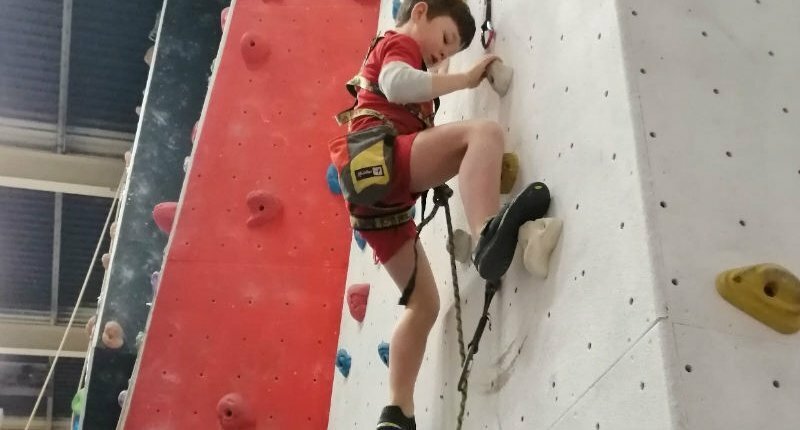 If it’s a lack of confidence or fear that’s stopping them progressing I will say something like “try chalking your hands first, and then if you still want to come down I’ll lower you down”. This forces them to think, and just this action of chalking their hands might be enough for them to find the confidence to continue with the climb. (Learn more about amygdala hijack and a fear of heights here). And now my kids are climbing bigger, higher walls, I can no longer clamber to the top with a Hula Hoop in my hand. So now we have the ice-cream challenge instead. Every session, my kids get the ice-cream challenge whereby I set them some daft challenge (at an individual level) that if one of them achieves then they all get ice-cream for pudding that day. If two of them manage it then we have ice-cream two nights that week and so on. It is daft but it works. Do whatever works for yours. As ever, incentives are a great way forward. 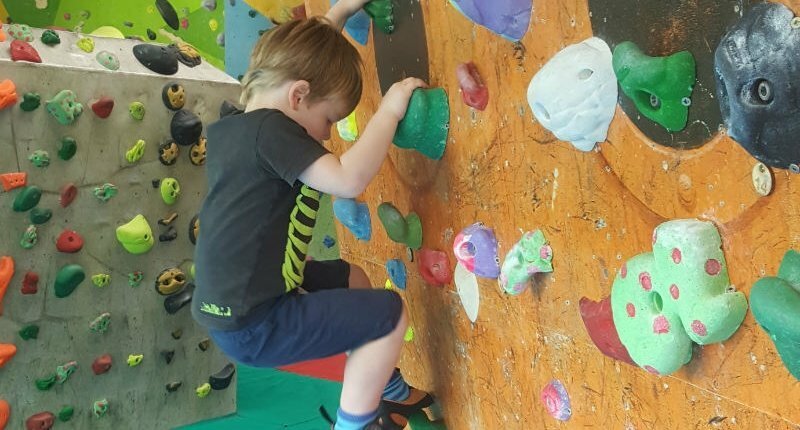 The obvious choice for those first forays is the Mini-Works which is a dedicated bouldering-only venue and is designed specifically with kids in mind. Big bright paint schemes and slides that return your youngsters back to the floor make this the perfect venue for youths. Plus you don’t have to be hard-core mountaineer either since there are literally no ropes to learn! The Foundry on Mowbry Street is where it all began for indoor climbing in Sheffield. This is Sheffield’s (the country’s too maybe?) first commercial climbing wall and it’s got bags of atmosphere about it too. 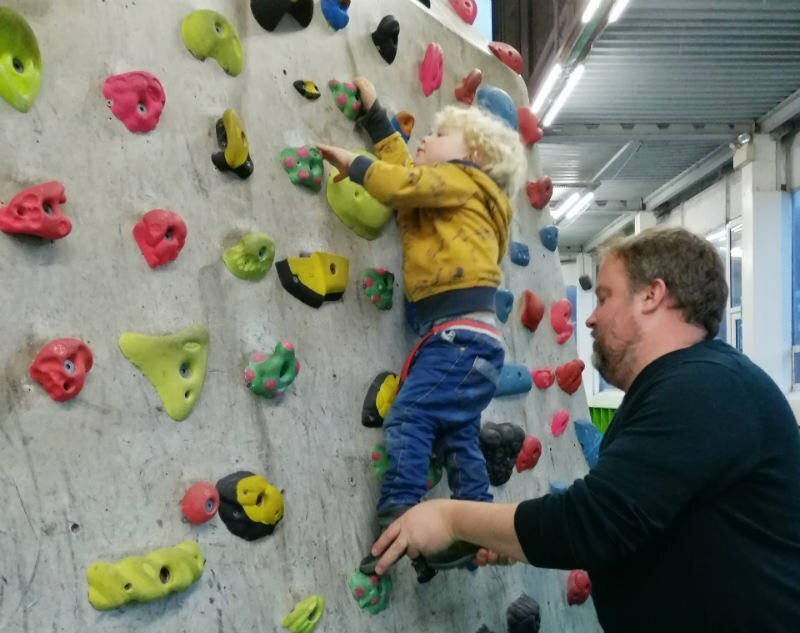 For the kids there are the bouldering walls, auto-belays and if you ever bump into one of the owners who could easily be climbing there, you will see how mischievously and wonderfully “can-do” they are when it comes to their approach to kids climbing. Awesome Walls on Garter St also have a great team of friendly staff and, like the Foundry and the Mini-Works, also offer excellent kids’ clubs and classes. One of the great things I love about taking my kids to this venue is that they have a small play zone where you can leave the kids to … play (obviously supervised … remotely) allowing me to get on a few routes myself! Whichever venue you choose your kids will love it! My kids are still climbing and they impress me with what they can do. They’re all still primary school age and they will happily climb indoors and out. Without a doubt before they’re teenagers they’ll be leading routes harder than I’ll ever manage! It’s been brilliant watching them grow physically, in confidence and in courage! Try it.